LifeTopix and My.Agenda are personal organization apps for iPad, iPhone, and iPod touch. Both apps are especially useful for those who utilize David Allen’s Getting Things Done® (GTD) method. We’re constantly incorporating features that are useful for GTD, and we enjoy sharing our best practices for using these features. In this post, I’ll show you how you can use LifeTopix’s features to help you capture and collect things that you’re carrying in your head and that are competing for your attention. Allen lays out five key phases of the GTD process, which include 1) Capture/Collect, 2) Process, 3) Organize, 4) Review, and 5) Do. This post focuses on the Capture/Collect Phase of this workflow and describes the many ways that you can capture and collect items that are on your mind. Allen’s thoughts around capturing everything that’s floating around in your head is of greatest importance because once these items are off your mind, you’re no longer burdened by them. Just like removing clutter from your home to create a relaxed environment, removing clutter from your mind into a trusted system gives you a sense of relief and order. Capturing these ideas, plans, etc. allow you to carry through on them and move them through the workflow. LifeTopix and the starter app, My.Agenda, are ideal tools for capturing things and helping you to follow through on items that you must do and goals that you want to achieve. The Quick Inbox was designed with GTD in mind. Its purpose is for quickly capturing everything that’s in your head for processing later. It’s perfect when you’re short on time, or for items that are not on your immediate agenda, or for “ticklers,” which are items that have a definite date in the future such as a wedding you’re attending. Most of us keep our smartphones handy at most times so a personal organization app such as LifeTopix or My.Agenda are the natural choices for recording these items that pop into your head or are demanded of you. You can easily access the Quick Inbox by tapping the Inbox icon in the left pane then tapping the plus sign in the upper right corner. The Quick Inbox displays as shown below. You simply type a description of the item, optionally add an Act by date or you can tap Soon or Someday for items without a clear due date. These items are added to the Soon or Someday buckets — depending on how you’ve defined them, and all dated items are added to the Soon bucket. When you’re ready to process these items, you can easily convert them by tapping on the green arrow and then tapping Convert as shown below. When using the Quick Inbox, you can convert the items to tasks, notes, appointments, reminders, projects, trips, visits, attending events, hosting events, shopping lists, or gifts as shown below. Once these items have been converted, you can add details that support the next stages of the workflow — (Organize, Review, and Do). Keep in mind, you should set a time each day to review and process these items that are waiting in your Quick Inbox so they don’t fall through the cracks. The Quick Menu gives you access to many important features for capturing information, such as the Quick Inbox discussed above, Quick Add, and the Quick Log. You’ll find the Quick Menu as indicated in the image below. 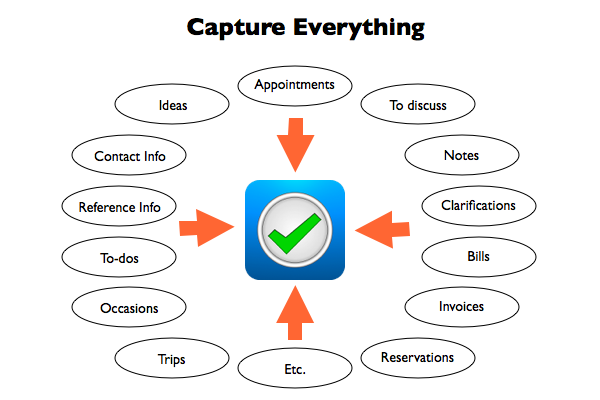 Through Quick Add, accessible from the Quick Menu, you can add tasks, shopping items, checklists, notes, appointments, reminders, bookmarks, files, expenses, projects, events you’re hosting or attending, trips and visits, service providers, assets, audio, drawings, occasions, bills, photos, videos, device reminders, and device events. When using Quick Add, you can move directly to the Processing step and add all the details of the entry immediately, if you wish. You can also capture items directly in the Agenda view, which is the view that shows your to-do lists/checklists, and what’s important today, tomorrow, and the next seven days. The Agenda view is a perfect place to add several types of items to the Quick Inbox described earlier, or through Quick Add. Through the Agenda view, Quick Add allows you to add tasks, shopping lists, notes, appointments, reminders, expenses, projects, events you’re hosting or attending, trips and visits, occasions, bills, device reminders, and device events. When using Quick Add, you can move directly to the Processing step and add all the details of the entry immediately, if you wish. For items that need to be scheduled at a fixed time such as meetings, doctor’s appointments, or social events, the LifeTopix calendar is the logical place to capture them. Much like the Agenda view, simply tapping the plus sign allows you to add events you’re attending, events you’re hosting, appointments, reminders, occasions, device events, and device reminders as shown below. You can capture any type of item through the My Topics view by tapping one of the cards, and you’re given full access to all the details of the entry. You can see an example of the My Topics view below. The 12 life topics include Tasks + Projects, Shopping, Events, Travel + Places, People + Services, Health + Activity, Finances, Home + Assets, Education, Notes + Files, Media, and Bookmarks. To learn more about the 12 life topics, refer to the 12 Life Topics. For those who prefer list-based notes for ubiquitous capture, LifeTopix or My.Agenda provides the flexibility to capture these notes directly from the Notes + Files Topic. And they allow you to capture these notes via voice/audio, text, and through free-hand writing. You can also add checklists/to-do lists from the Notes + Files topic. You can share these notes via social media, email, or text messages. The Notes + Files topic is also the perfect place to capture reference materials such as class notes, meeting notes, coupons, health docs, manuals, financial items, legal docs, etc. You can attach a file to these notes, take a photo, or use online notes (such as Google Docs or Evernote). As a side note, if you want to access the Notes + Files Topic quickly, you can add All Notes to the Hot List view for one-tap access. You’ll find in LifeTopix or My.Agenda that there’s several ways to capture everything that’s in your head. Hopefully the items that I touched on will get you started to living a more productive, stress-free life. Please comment!